This printable is perfect to copy and have students place in the front of their binder. You could also hang it in your classroom. It contains 30+ things for your student to do when he/she is finished with his/her work. This is great for those early finishers and it gives you time to work with students who need extra help. 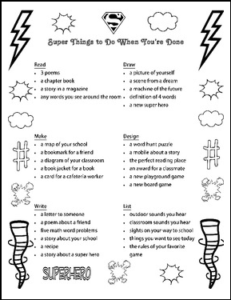 This printable has a super hero theme that I think your students will love!